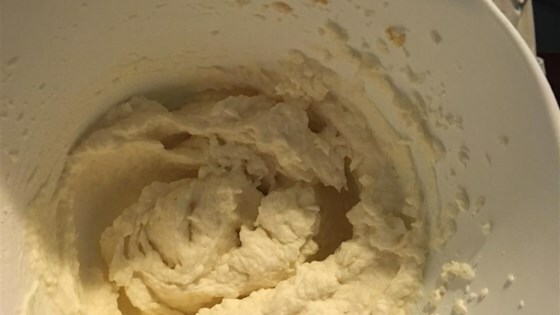 "This vanilla-flavored cake icing recipe uses gelatin to thicken the mixture of heavy whipping cream and confectioners' sugar." Mix gelatin and cold water in a small saucepan, and let the mixture stand until gelatin thickens. Cook over low heat, stirring constantly until gelatin dissolves. Remove from heat, and let cool; do not let set. Whip cream, sugar, and vanilla until slightly thickened. Continue beating slowly, while gradually adding the gelatin. Whip at high speed until stiff. This recipe is very good and correct. If you, as other reviewers, can not make this, try something simpler first, like boiling water. I followed the instructions exactly. Icing did not turn out at all. I threw it away.